5 pm: Hit Little Italy, named Tupper Lake’s best Italian restaurants according to TripAdvisor, for some pizza and wine as soon as you get into town. Lounge and chat with locals for two hours, but make sure to get out by 7:30 p.m. to watch the sunset! 8 pm: Walk over to Tupper Lake Municipal Park to watch the sun go down. Sitting in heart of the Village of Tupper Lakes, the park is the perfect place to take a stroll or sit on the lake to watch the sun recede and the sky turn pink. 10 am: Start your day off right with an authentic lumberjack breakfast at one of the local diners. You’ll need the calories for what lies ahead! Make sure to grab a sandwich and water for a lunch on the go in the afternoon. 11:30 am: Head to the world-renowned Wild Center where you can spend the afternoon wandering wildlife exhibits, watching otters swim, and roaming the nature trails. 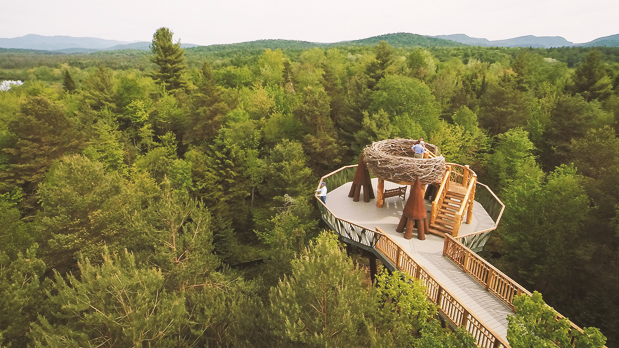 Make sure to check out the Wild Walk, the region’s only trail across the treetops. 4 pm: Spend the afternoon exploring the lake coast on a pedal powered railbike - it’s like an open air, foot-powered personal train car just for you! 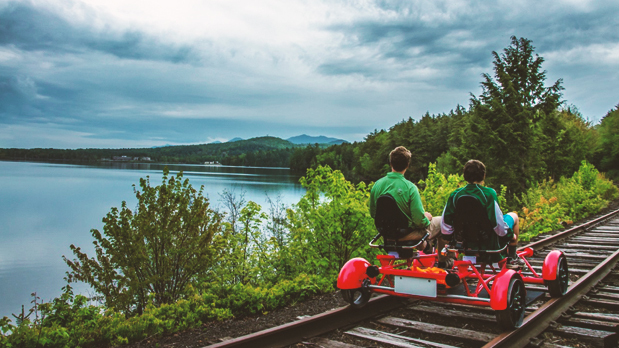 Follow the train tracks around the length of Tupper Lake, soaking in the beautiful nature scenery as the breeze from the water grazes your face! 6 pm: Stop by the Well Dressed Food Company (named no. 1 restaurant in Tupper Lake on TripAdvisor) for a healthy, rejuvenating dinner after your long day of nature exploration. Your adventure is far from over, so be sure to hydrate and carb up! 7:30 pm: It is imperative that you make it to the Adirondack Public Observatory by dusk – you’ll never see a sunset the same! Tupper Lake’s state of the art facility is miles and miles away from surrounding city lights, making its stargazing and views of the expansive skyline truly unforgettable. When it gets dark, explore the above on a more micro level through various telescopes. It’s an out of this world (sorry, we had to) experience! 10 pm: You deserve a drink. Head to Big Tupper Brewing for a locally crafted beer! Try their signature brew, the IPA ‘eh’. Say it like a Frenchman, drink it like an Adirondacker! 10 am: Grab a coffee at Kricki’s – voted best coffee in Tupper Lake on Yelp. Is it hot? Grab an ice cream, too – they’re known for their delicious scoops. You’re on vacation for goodness sake! 10:15 am: Spend the morning relaxing on Little Wolf Beach, considered by many Tupper-ites to be the town’s hidden gem. It’s a town run facility for the whole family, with activities like paddle boarding, snorkeling, volleyball and nearby playgrounds for the little ones. 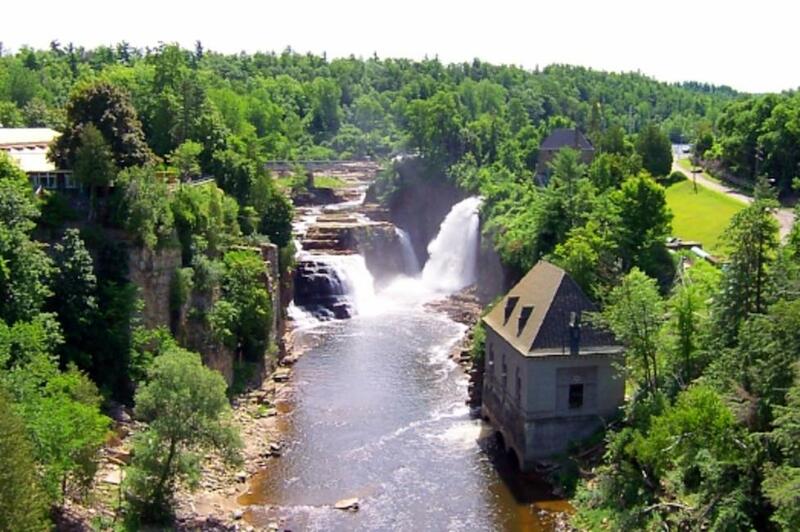 12 pm: Now that it’s started heating up, head to the breathtaking Ausable Chasm, where naturally formed sandstone aging back to 500 million years ago creates nice cool shade. 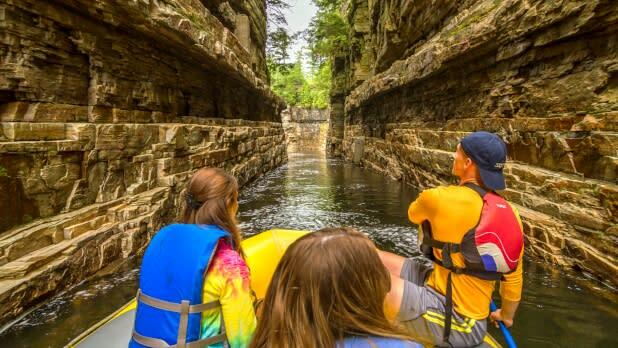 Make sure to take a family float tour through the Grand Flume and Whirlpool basin. Amtrak to Westport Station (1 hour from Tupper Lake – take a shuttle, taxi or rent a car) Book fast and receive 15% off any travel from NYC to select destinations throughout New York State! Trailways or Greyhound to Saranac Lake.